Joyetech Ornate Sub Ohm Tank Review - Daily Vaping Deals & The Best Vape Product Reviews at Vaping Cheap! 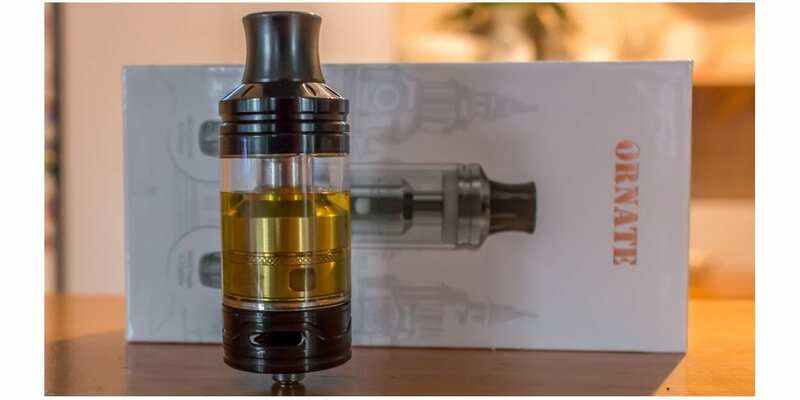 Before we get into the Usage and Performance of this tank, I’d like to thank GearBest for sending this my way for the purposes of this article. Check out the Joyetech Ornate Here! Click Here to Check Out the Joyetech Ornate! Joyetech’s packaging is instantly recognizable with any product in their line and this one was no different. A white and silver box with a picture of the Ornate and coils on the front. The tank is packed in securely with the box of spare parts sitting below it neatly. There is definitely no issues with this tank getting damaged in transit. The tank itself looks unique to others currently on the market, with it’s tapered drip tip, the leading lines around the airflow section and the bevels at the top. It feels solid and well made with no burrs or janky threads to mention. There is some weight to the tank, however not over the top, which aids in making it feel of quality production. Overall, I think the tank looks quite nice and it appears to be well made. 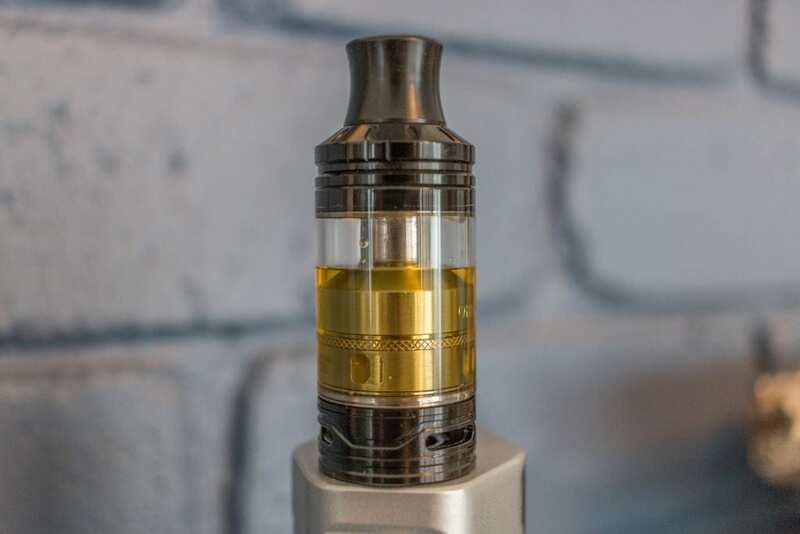 The tank stands 70mm tall and boasts a 6ml juice capacity, which is in fact quite a lot of juice for it’s size! There was no machine oil smell or reminiscence that I could detect, which is a definite plus in my book. There are 3 airflow holes at the bottom of the tank and the airflow ring can be adjusted easily without resistance. The spare parts included are a spare glass tank section and a bag of o-rings. There is also a mouthpiece adapter included to enable you to use your favorite 510 compatible drip tip. The fill ports are located at the top, once you screw the top cap off, and are over-sized kidney shaped holes. These seem that they would accommodate any size bottle tip or dipper that you could throw at it. The Ornate came with the MGS Triple coil head installed, which ohms in at 0.15 and is rated for use between 70 – 260 watts. The recommended output range is between 100 – 160 watts. The other coil that comes with this tank is the MGS SS316L coil head, which is also 0.15 ohms. It is rated for use between 60 – 180 watts and the recommended output range is 80 – 130 watts. Being stainless steel, this coil head is designed for use in TC mode. The coils themselves seem to be well produced, with their housings made from stainless steel and from what looks to be fairly good quality cotton installed. Filling the Ornate tank is a breeze, simply unscrew the top cap and you are presented with the huge fill ports we talked about earlier. Fill with your desired method until you reach the top and your all ready to go. The manual does say to prime the coils if possible and to take a few priming puffs before firing up the coils on your mod. I found the coils definitely have a break in period somewhere between half to 3/4 of a tank before the cotton taste truely dissipates. The airflow is nice and easy to adjust and once adjusted it is the same across the board for each of the three airflow holes. The airflow ring does not free spin, it locks at either end of the spectrum being either fully open or fully closed. There are no locators in between, so you can fine tune it to just how you like it. I found the Ornate tank to make good fitment to all the mods I placed it on and the coils all read the same on each mod, so there were no connectivity issues, mis-reading or ohm jumping occurring. It easily breaks down into 5 parts for cleaning and replacing the coils, and it all comes apart fairly easily and as to be expected. I did experience some leaking with the Ornate and this was with both coils as well. Initially after filling, it all seemed okay and appeared that there was no obvious leaking. Then after it had sit for a little while to ensure the juice was soaked into the wicks, I took a vape and noticed juice was leaking onto my hand and mod. I thought this was initially to do with not giving it enough wattage, however it leaked intermittently while I was using it and also while I was not using it. Being a 25mm atty, there is no room for the leaked juice to catch anywhere before spilling down onto your hand and your mod. I’m unsure if this issue has to do with the design of the tank itself, the coils or just having an unlucky unit. After looking on the Joytech website I did read that the juice flow was adjustable on the triple coil head, I did have a play around with this but still experienced some intermittent leaking. There was no mention in the manual about the triple coil head having an adjustable juice flow, to adjust it you simply rotate the valve to expose more of the wick to the reservoir. You will need a high powered mod to make the most out of this tank. I knew that I would be going through some decent battery life testing this tank, so I opted for the RX200S as it uses three batteries. I started the way I normally do when trying all sub ohm tanks and that is to start at a low wattage like 30 watts and slowly work my way up. For me, between 30 and 90 watts, there was barely any movement. At 100 watts it started to move the needle somewhat, it was an airy vape with fairly whispy amounts of vapor. The taste was there, but no where near what I was expecting. At 110 watts, the flavor improved slightly and the vapor production was increased. Passing 120 watts and then to 130 watts is where this tank started to come alive. The vape was warmer, the flavor was good and the clouds were starting to appear. Everything started to improve as I moved up to the 150 watt mark, but I was noticing that the mod was getting quite hot. The tank was hot to touch, but the glass was even hotter and it took a long time before it cooled back down to room temperature. I found that 160 watts was probably the maximum for me before the vape got too hot for my throat. 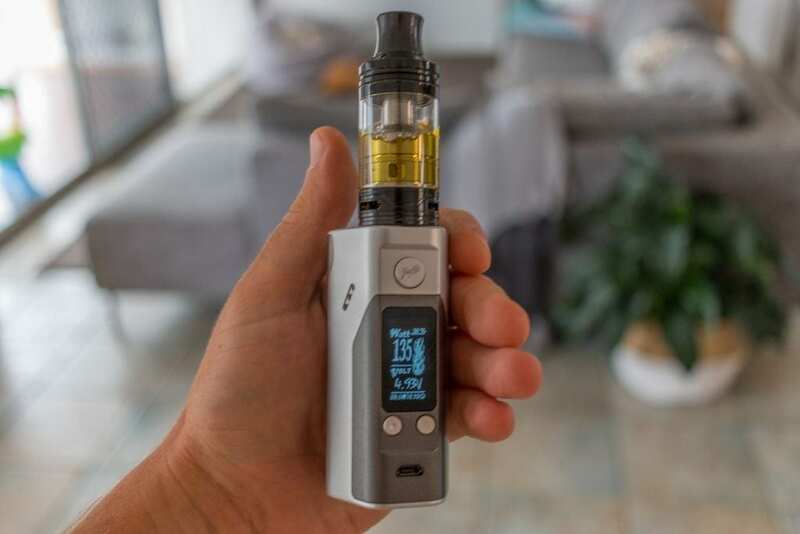 At this wattage the flavor and cloud production was dense and flavorful, I personally don’t like my vape to be too hot but this is subjective to how you like to vape and others my find that they can go even higher, it seems that this tank would certainly accommodate for that. You will find that the Ornate guzzles the juice at these high wattages, so be prepared and make sure you have a good stash of juice to throw at this thing. The airflow was quite accommodating for the wattages that are needed for this tank. It was very smooth across the board and in combination with the wide bore drip tip, the airflow was definitely sufficient for this tank. In no way did I find it restrictive, even when backing off the airflow a little to try evaluate how it would affect flavor concentration. One thing I found to be a bonus was that I never experienced any spit back or gurgle from this tank. Probably a good thing given the high temperatures that it needs to be vaped at, you don’t want molten hot liquid on your tongue. If you like to vape higher VG based liquids, the Ornate can take some time to rewick effectively. I found that with higher percentages of VG, you definitely cannot chain vape without taking a rest after every couple of tokes. Even with the juice flow control set to the maximum setting, I found that after two or three good hits, it was getting a little dry. Definitely not a dry hit, so to speak, but I could definitely feel it getting dry. So keep this in mind if you prefer high VG blends. I found the TC coil to perform well at a lower wattage, but don’t be fooled you still need a mod capable of handling at least 120 watts for this tank with either coil. The TC mode operated as it should and the standard TCR setting for SS316L on the RX200S was fine with this coil head. I don’t think the flavor or vapor production on the TC coil head was as prominent as with the triple coil head, but performed well none the less. 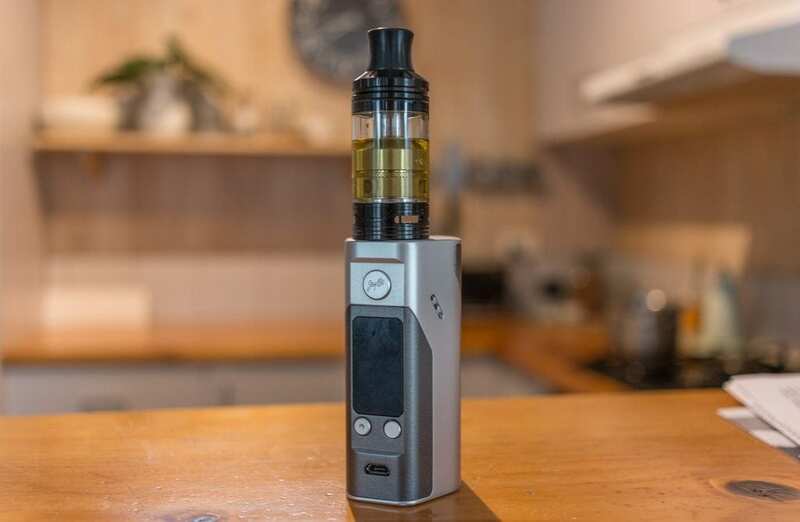 I think the triple coil is where Joyetech have aimed this tank at, given that it has the adjustable juice flow as well. Joyetech have obviously made a target for the Smok TFV8 here and I think they have done a good job in doing so. Personally I prefer the vape I get of the TFV8 due to the extra airflow and the flavor concentration at lower wattages. This is definitely highly subjective, but what works for me personally. I do think, however, that if you have tried the TFV8 and want something even more powerful, then this would be tank for you. To summarize, the Ornate will perform with a high powered mod. And it will perform very well. For those that do not own a mod capable of firing at least 120 watts, you simply will not be able to use this tank to it’s fullest capabilities. If you like a hot vape and enjoy chucking big clouds, then this tank would definitely be up your alley. It’s not a perfect tank, it will get hot and it may leak a little from time to time, bit if that doesn’t bother you then I have no hesitation to recommend this tank you if it sounds like something you are after. I hope this has helped somewhat in your quest to find your next favorite sub ohm tank! Let us know if you have any questions or thoughts in the comments below.